For the past year, nutrition power-house kale has gone from being hippie food to a staple supermarket find. 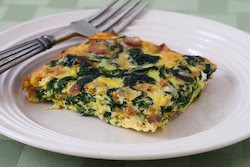 If you read any nutrition articles either in magazines or online, I will bet that you’ve read about kale at least once. When I was home in Colorado last December, my mom and I went to a new buzzed about restaurant. Guess what was featured all over their menu: kale. So what’s the big deal about this strange-looking leafy green? And where can you get some yourself? Belonging to the Brassica family, Kale is related to cabbage, collards, and Brussels sprouts, all of which are known for their high density of nutrients. Just how healthy is kale? According to Whole Foods’ chart, 1 cup of cooked Kale (130.00 grams) contains almost all of your daily vitamin K, vitamin A, and vitamin C; along with a significant amount of your daily manganese. 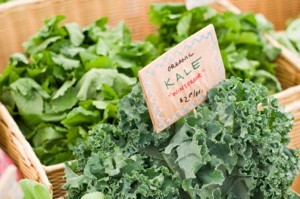 If you’re not impressed then think of this: 1 cup of cooked kale contains all of those nutrients for only 36 calories. To get the most flavor and nutrition out of kale, you should first rinse it under cold water, sprinkle it with lemon juice and then let it sit for 5 minutes. We recommend the cooking kale by steaming it for 5 minutes in a steamer pot. 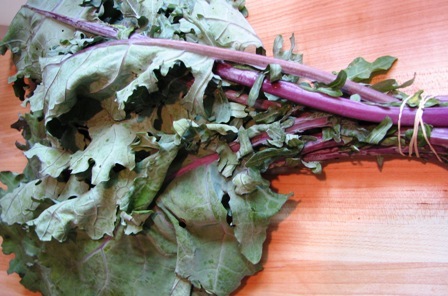 This week’s CSA box contains Red Russian Kale, which has a milder taste and is less bitter than other varieties, making it the perfect way to introduce kale into your diet! Heat olive oil in large frying pan, then add onions and saute for 3 minutes. Add garlic, sauteing for 2 more minutes, then add kale and saute for 5 minutes until kale is wilted and softened.